Discover the German spirit in this land of romance, fairy tales and radiance. 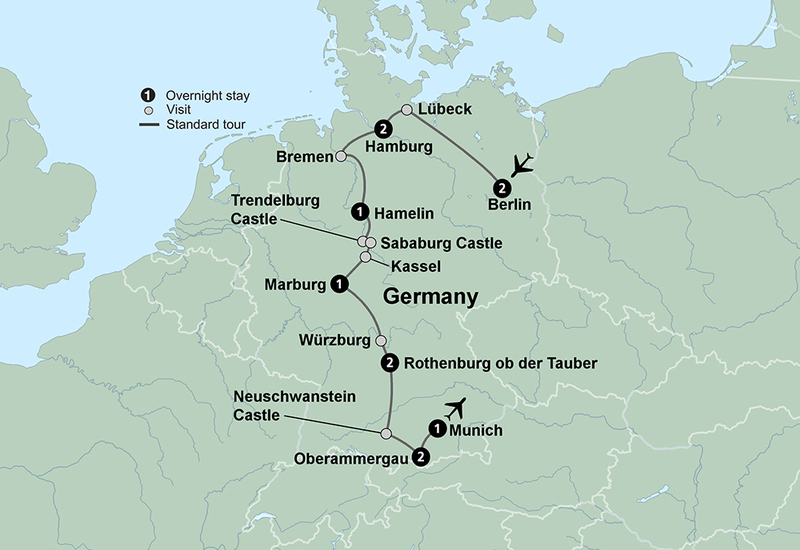 Come to know the allure of some of its most iconic cities - Berlin, Hamburg and Munich. Tour the historic landmarks of Berlin with a local guide. Visit a café in Lubeck, the birthplace of marzipan, and take a walking tour of Hamburg 's red-light district. Spend a night in enchanting Hamelin located on the Fairy Tale Road and embark on a guided tour with a Pied Piper. Immerse yourself in a fairy tale at Rapunzel 's castle and visit the Brothers Grimm Museum. Stay two nights in charming Rothenberg on the Romantic Road and delight in a “Night Watchman” tour. Decide between making “Schneeball” pastries or tour the Medieval Crime and Punishment Museum. Admire Neuschwanstein Castle before concluding your tour in Oberammergau with a memorable and moving performance of the Passion Play; the origins of this historic event date back to 1634. Your tour opens in Berlin. This city blends a deep history, a modern flare and multi-cultural influences. Tonight, join your fellow travelers for a welcome dinner. This morning enjoy a traditional city tour that features Charlottenburg Palace, Kaiser Wilhelm Memorial Church, the Schoenberg City Hall, Kurfuerstendamm, the Reichstag building and a stop at “Checkpoint Charlie," the best-known Berlin Wall crossing point between East and West Berlin during the Cold War. Your destination is Hamburg with its winding canals and impressive harbor that have made it a center of trade for centuries. En route, make a stop in the medieval Hanseatic League town of Lübeck, the famed birthplace of marzipan and a UNESCO World Heritage site. Join a local guide for a tour of the town and have a chance to visit Café Niederegger to shop for the marzipan they have been making for 200 years. Arrive in Hamburg. Tonight, enjoy dinner out on the town. Come to know the city on a panoramic tour that showcases the Rathaus (Town Hall), the Alster, St. Michaelis Church, the city center, the beautiful Jungfernstieg promenade and, of course, the port of Hamburg - dubbed the “gateway to the world.” Later, it 's your choice! Board a harbor boat for a narrated cruise around the massive Hamburg shipping port highlighting the key maritime sights. Or, embark on a relaxing boat cruise on Alster Lake to take in stunning views of the shoreline dotted with the homes of Hamburg 's elite. Later we gather for a walking tour of the Reeperbahn area, Hamburg 's red light district, immortalized as the place where the Beatles cultivated their fame in the early 1960s. Join in the fun with your “singing and ukulele playing local Beatles expert” and travel down memory lane. Today 's first stop is in Bremen, at the beginning of the Fairy Tale Road. Join a local guide for a walking tour of this quaint town featuring the musicians of Brothers Grimm fame, the Town Hall (UNESCO), and the medieval Schnoor district. Later, travel to Hamelin, made famous by the Pied Piper legend from the stories of the Brothers Grimm. Feel like you have stepped into a storybook when the “Pied Piper of Hamelin” plays delightful tunes while he leads you on a discovery walk through Hamelin with its charming Tudor-style architecture. Journey to the perfectly preserved medieval town of Rothenburg ob der Tauber, located in the middle of the famous Romantic Road and in the heart of the Franconia wine region. En route, make a stop in Würzburg, a Bavarian wine town known for its lavish Baroque and Rococo architecture. Enjoy time to explore the town on your own before continuing to Rothenburg, located high on a plateau overlooking the Tauber River. Arrive at your city center hotel, the perfect location to discover this captivating town. Take an evening stroll to a local restaurant where you 'll enjoy a tasting of local wines followed by a traditional German dinner. Later, join a colorfully costumed local expert for the famous “Night Watchman” walking tour of this medieval town. It 's your choice! Join in a walk to a local bakery to make “schneeball” pastries - snowballs - a favorite treat of the locals! Or, tour the Medieval Crime and Justice Museum. Later we gather to spend time at the famous Käthe Wohlfahrt Christmas Museum where you will be treated to a private tour, enjoy an ornament-making demonstration and shop for handmade Christmas ornaments. The remainder of the day is at leisure. Today we make our way through mountains and along winding country roads for a tour inside the famous Neuschwanstein Castle. Built by the “crazy” King Ludwig II, it is the most photographed castle in Germany. Next, continue to the quaint, picturesque village of Oberammergau. This afternoon, witness a performance of the epic Passion Play. The original performance dates back to 1634. During the Thirty Year War, Oberammergau was spared the Black Plague and for this reason, the citizens vowed that every ten years they would give a play to honor the last days of the life of Christ. The performers of this once-in-a-decade event are all native to the village. To lend authenticity to the performance, the cast start to grow their hair and beards more than a year in advance. Also, the intricate costumes are made locally by the villagers. During a break in the performance, join your fellow travelers for dinner before returning for the remainder of your Passion Play performance. Today we travel to Munich, the exciting capital of Bavaria. Feel the energy of this lively city during a tour that highlights Olympic Park, the world-famous Glockenspiel;* and Marienplatz, a beautiful square surrounded by shops, restaurants and cafés. Enjoy time to explore Munich before gathering with your fellow travelers for a farewell dinner celebrating the end of your memorable trip. This morning your tour comes to a close. This morning you are transported back to childhood as you come face to face with the real life places, and characters, that inspired the fairy tale classics. First, meet a local storyteller at Schönburg Castle, where you will be greeted by the Princess and her Prince Charming. Have time to explore the enchanting grounds before traveling to the famed “Rapunzel 's Castle” - Trendelburg. Continue on to Kassel, home to the Brothers Grimm Museum. At the museum, an expert will lead you on a tour through the interactive displays that bring you through the life of the Grimm Brothers. Journey to the medieval university town of Marburg with its endless alleys and stairways that lead to the castle perched above. Berlin is the capital and the largest city in Germany. Berlin is located in northeastern Germany on the banks of the River Spree. Berlin dates back to the 13th century. Throughout history Berlin has played a major role in several wars including World War II and the Cold War. After the Cold War ended, the Berlin wall, which divided East and West Berlin, fell. Part of the wall is still intact and visible today, and serves as a reminder of an important part of Berlin 's history. Today, modern Berlin is known for its many cultural attractions, architecture and its high quality of living. The largest German port city on the Baltic Sea, Lübeck is located in Schleswig-Holstein, the northernmost state of Germany. It is the only city in Germany that still has a large medieval city. It appears on the United Nations Eductional, Scientific and Cultural Organization (UNESCO) World Heritage List as a site of outstanding importance. Hamburg is Germany 's second largest city and is known as the country 's Gateway to the World. It 's one of Germany 's most well known and affluent cities with a maritime spirit that can be felt in its architecture and savored in its food. A town in Lower Saxony, Hamelin is the place where the Pied Piper of Hamelin expelled rats from the town by playing his pipe. The picturesque town full of beautifully restored timber-framed and sandstone buildings (some dating back to the Renaissance!) is ideal for bike rides, scenic walks, boat trips and water tours. Throughout the streets of Hamelin there are thousands of friendly-looking rats painted on the pavement that point the way to main attractions around town. Many of the sites are related to the story of the Pied Piper, but at the center of town sits the Pied Piper house, one of the biggest and most beautiful Renaissance buildings in Hamelin. Visitors may even catch a glimpse of the Pied Piper himself! Three incredible castles are renown for inspiring the fairytale atmosphere of Germany. Trendleburg Castle, home to the tale of Rapunzel, imprisoned and saved by her golden tresses. Schönburg Castle, where you can join in the fantasy and meet the “Princess” and her “Prince Charming.” And, finally, Neuschwanstein Castle, which is so strikingly beautiful it became inspiration for Disneyland 's Sleeping Beauty Castle. This city of 125,000 is on the Main River, and traces of its history as a Bronze Age, Celtic and Frankish can be found still. It was the site of one of the world 's largest witch trials in the 17th century with as many as 900 witches burned at the stake. On one day in March 1945, 90% of the city was destroyed by British bombers and the firestorm which resulted. Now the city is an important administrative center and center of the local white wine industry. Rothenburg is known for its well-preserved medieval center that seems totally untouched by the passage of time. Surrounding the town is a substantial 14th century town wall that speaks of Rothenburg 's past as a successful free imperial city. It is one of Germany 's best shopping towns and visitors can expect to find lovely prints, wine glasses, Christmas ornaments and beer steins. Germany has thirteen official wine regions with some of the most beautiful landscapes in the country. Of course, along with great wine comes great food, stately castles and manors too—all the things you 'd expect from a country that 's been making excellent wine for a very long time. At night in the picturesque village of Rothenburg ob der Tauber the night watchman makes his rounds, bringing tourists on an hour of medieval fun. He makes jokes as he stokes his lamp and walks around the village recounting gritty tales about real life to the delight of his companions. This fairy-tale castle was built on the ruins of an earlier castle by King Ludwig II of Bavaria, beginning in 1864. The king had spent time in his youth in the town near the site of the castle, and when he took the throne he began building a fantasy castle on the ruins of two earlier fortresses. Many of his fantasies came from his love of the musical mythological works of Richard Wagner, who was his friend, and he spent most of his personal fortune and borrowed to build Neuschwanstein Castle. He only lived there 172 days before his death. The castle was an inspiration for the Disneyland Sleeping Beauty Castle. Travel to the picturesque Bavarian hamlet of Oberammergau and witness a performance of the epic Passion Play. This legendary play is only performed every ten years, and has been performed every ten years since the Black Plague ended in 1634. This is the 3rd largest city in Germany and capital of Bavaria, population about 1.5 million in the city itself. It began as the site of a Benedictine monastery where the old city is today, and the name of the city comes from the word “monk”. It is famous today as the home of Oktoberfest and the Hofbrauhaus, the Glockenspiel clock in the Old Town Hall, its Christmas Market and the headquarters of BMW and Siemens. There are several universities there and it was the site of the 1972 Summer Olympics.